My Bargain Basket: T.G.I Fridays: FREE Appetizer or Dessert! 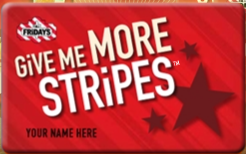 Sign up on TGI Friday's Give Me More Stripes Rewards Program and you will get a FREE Appetizer or Dessert. As a member you will recieve many perks. Check it out at the TGI Fridays website to get your FREE Appetizer or Dessert.